Perfect for pool time or the beach. Your little baby can splash happy without you having to worry about a soggy diaper. Pampers Splashers swim pants are specially designed for pool or water time. They provide protection against leaks in the water, but won’t swell like regular diapers. Their tear-away sides make it easier for you to change them, and they’re super stretchy to provide a snug fit in the water. Plus, the double leg cuffs provide protection from leaks. 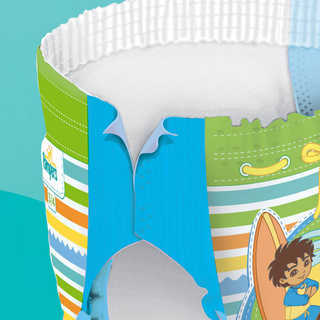 These diapers are ideal for the beach or pool time. Pampers Splashers Swim Pants come in sizes 3–4, 5, and 6. 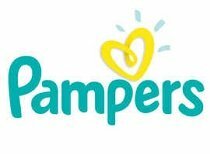 Get rewarded for buying Pampers! Collect Pampers Rewards points for every Pampers purchase you make. Then redeem your points for fun rewards at Pampers.com. Regular diapers swell up when they get wet. Splashers don’t, so your baby can splash happy. How many diapers will I change a day? In the first couple of months, you may find yourself changing diapers up to 10 times in 24 hours. Diapers should be changed whenever they are wet or soiled. Your baby will often (but not always) let you know. With a super-absorbent diaper like Pampers, you can tell if it’s wet by feeling for lumps in the absorbent material. Is there anything special I need to know about changing a diaper? Pampers Diapers are designed to adjust to your baby’s shape for a snug, comfortable fit. While you’re changing diapers, there’s no need to fold the waistband in or out or to adjust the leg cuffs. Place tabs parallel to the waistband and centered on the character strip. Use the characters as guides to ensure the fasteners are evenly spaced. Keep baby products such as powder away from the fasteners so they maintain their stickiness. What size diaper is right for my baby? Just like you, babies like to wear things that fit just right. Choose a size that does not sag or gap, even as your baby crawls and plays. This will help prevent leaks. Each product description on this site gives guidelines that represent the average weight for a particular size. And remember, when you move up a size, you gain absorbency. What’s the best method to weigh my baby? The easiest way to weigh your baby is to first hop on the scale yourself. See how much you weigh, then see how much you weigh when you hold your baby. If you subtract your weight, you’ll know how much your baby weighs. Is there any safety information I need to know about diapers? You buy the latest toys, and babies wind up playing with silly things—like diapers. It’s important to keep diapers where they should be, on your baby’s bottom. Don’t let your baby put the diaper in his mouth. Discard any diaper that has become torn or unsealed, and read the warning label on all bags. How do diapers absorb all that moisture? AGM is the absorbent gelling material widely used in diaper padding to absorb wetness. It is perfectly normal to see some gel on the skin from time to time, especially if the diaper is heavily saturated. It can easily be removed by wiping your baby’s skin. This material has a long history of safe use in a variety of products and has been in diapers for more than a decade. Absorbent gelling material is closely related to ingredients widely used in cosmetics and in food processing. Do unused diapers need to be stored anywhere special? Store your diapers in an area protected from extreme heat and humidity and away from products with fragrances. We recommend the diapers be kept in a dry storage area where the temperature is 85 degrees or less. Pampers Extra Protection diapers help eliminate nighttime leaks. Pampers Soft & Strong wipes, available in Baby Fresh and Natural Clean. Double leg cuffs help protect against leaks. Won’t swell up in water. Dora and Diego designs are great for boys and girls. Available in sizes 3, 4, 5 and 6.